Robot Gossip: Order Your Pleo Now. Not! Well it seems that there was some confusion with Ugobe. (see the comment to this post) They are not allowing any pre-orders yet. They are not quite sure of the price, maybe, or possibly they do not really have a firm date for deliveries, or maybe, they have not figured out why anyone would want to buy this thing anyway. They have been taking a huge risk by making all kinds of fantastic claims about the wonder of their robot Life Form and the potential market for it. The hype was more for the benefit of investors rather than users of the product but now they have painted themselves into a corner by trying to perform up to the expectations that they created. We shall see. 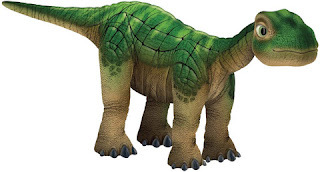 Matt Trossen has announced that Ugobe has given Trossen Robotics permission to start taking pre-orders for the wildly hyped dinosaur robot Pleo. This may be your best opportunity to be the first on your block to have a Ugobe Life Form pet. 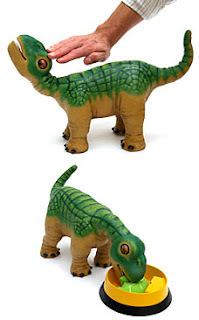 - (35) Sensors including a camera custom designed to fit into Pleo's very compact body. - (4) foot-switches to detect footfalls and being picked up - assists with spatial orientation. - (14) "Force" sensors, one per servo, to recognize abuse through force feedback joints. - IR transceiver for bidirectional data communication with other Pleos. My name is Julie Crabill and I work with UGOBE on the PR front. UGOBE has not officially begun any pre-orders for Pleo. The Trossen Robotics pre-order page was put up in response to unsanctioned communication from one of our partners. The page is in the process of being removed however there is likelihood that other sites may follow suit and you can be sure that we will ask for a similar response, ie. the removal of any pre-sell information. UGOBE has not confirmed retail channel partners, the official date we will begin taking pre-orders or the official date Pleo will ship. Once we have this information, we will share it openly with consumers, media and bloggers alike and issue press releases accordingly. Sorry for any confusion on this. Sit tight, Pleo is on the way this summer! Pleo was an awesome deal at $200, pretty decent at $250, but now, with the $350 number floating around, it's making me have doubts. That's $700 if I want one to hack and one for the wife to 'ohhh' and 'ahhh' over. Yikes! So many prices are posted between 200 and 400 EUR. I think it will costs more then 400 EUR.